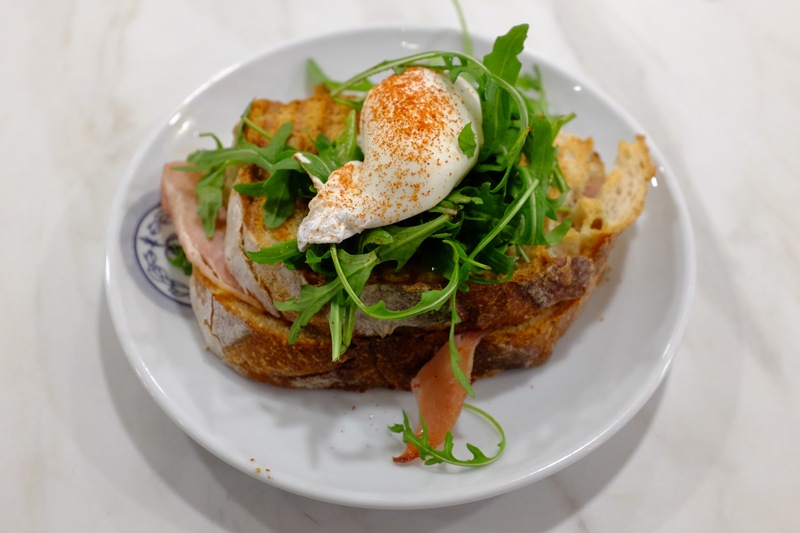 This might seem like a weird suggestion, but how about trying the new Jamaica Blue cafe at the Royal Berkshire Hospital… Looking at their website it seems like a successful Australian chain, they have only four branches in the UK. I’ve popped in a couple of times after appointments and the coffee was great. I was very pleasantly surprised by the range, quality and freshness of their lunch options, really nice deep filled flans and unusual sandwich/ciabatta choices. So nice I’d even consider dropping in if was in the area and I didn’t have an appointment. My curiosity was piqued. Partly because this was a hard sales pitch to resist: a promising new café in town that almost nobody knew about? How could I stay away? But more to the point, I live very close to the hospital, and many’s the time working from home that I’ve sloped up the Craven Road to visit the AMT just inside the main entrance. If the weather’s bad I have a Café Maya, and if the weather’s good (by which I mean anything above twelve degrees with no rain) I have a Froffee, that hypnotic, magical milkshake made with ice cream, espresso and dreams. But I never get any food there, and Café Yolk never quite feels worth the additional walk. I made a mental note: next time I was working from home I’d go to Jamaica Blue and try it out, a rare solo excursion. It’s odd going for lunch in a hospital, you know. It’s odd using the hand sanitiser on the wall-mounted pumps and going down long corridors lined with art best described as enthusiastic, dodging the beeping buggies that sedately trundle past you. It’s odd walking past the queue for the pharmacy, past the fracture clinic, past Respiratory Medicine. For someone with a touch of hypochondria like me, all those department names read like Panini stickers you’re yet to collect: got, need, need, need. 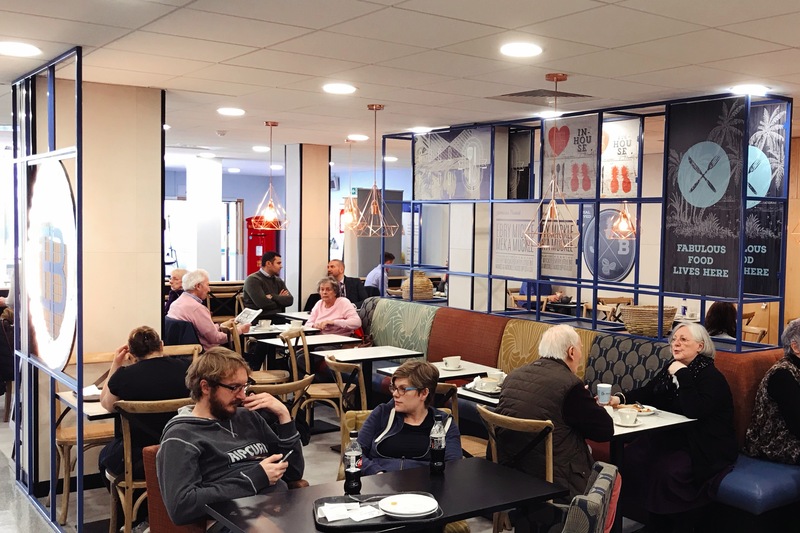 What’s also odd is reaching the spot where Jamaica Blue is, by South Block Outpatients, near where they do the blood tests, and seeing what looks like an actual proper café just plonked in the middle of a hospital. On one side of their stylish blue partition it was all people waiting for appointments at grim, municipal-looking tables. On the other side, people were sitting at much more fetching tables in comfy chairs, tucking into food. Snazzy brass-effect light fittings hung from the ceiling and a range of canvasses on the back wall spelled out the range of coffees on offer. Were these people actually ill, or just gastronomic tourists like me? Was everybody else in on the secret? Or perhaps this was just a mirage, an oasis among the sand dunes stretching out for miles. A small queue was forming at the counter so I took my place and looked at the embarrassment of riches in the cabinet. Anna was right – many tempting things were there. An antipasti focaccia looked like it might be the real deal rather than, as so often, a ciabatta using a fake ID. The ciabattas and bagels appeared pretty standard issue, but there were plenty of other interesting options. I considered the tortilla stack, the deep feta flan and the sausage rolls (I considered the sausage rolls for some time, in truth) before narrowing my choice down to a binary one just as I got to the front. She went to fetch someone to talk me through what went in to the chicken pasta bake. It was a big, appetising-looking slab and I could see chicken and tomato through the cross section. A friendly chap came up to the counter and explained to me everything that went into one, in such exhaustive detail that I couldn’t possibly remember it all. I did remember one phrase though, which stuck with me: “There’s cheese at every level”. A lovely sentence to apply to food (if less so to, say, a nightclub). “Of course it is” came the reply, making me feel ever so slightly stupid for asking. But I’d have had to ask in a Costa I wanted to say, but it would have sounded peevish. Besides, Costa would never do a croque madame. “I’ll have the croque madame.” I said. The gentleman behind me, having heard the sales pitch, ordered the chicken pasta bake. I made a mental note to try and avoid sitting near him, in case of food envy. “How long have you been open?” I asked one of the ladies behind the counter as I waited for my coffee to be made. She smiled as if she was asked this often. “Maybe we’re just here to make people’s trips to the hospital more pleasant.” Again I wondered: was this whole thing some kind of dream sequence? Everyone serving me was so pleasant, so happy and, seemingly, so proud to be dishing up possibly the only decent food in the Royal Berks (I was surprised, heading home afterwards, at how full Pumpkin was). I took a seat at the banquette with my coffee and waited for my sandwich to arrive. The latte was beautifully presented, nicely smooth and had a slightly bitter note but was on the right side of burnt. Jamaica Blue make much of their coffee – and you can buy it for consumption off the premises – and I liked my latte a lot, although it didn’t quite reach the heights of a Tamp or a Workhouse. An older couple next to me had got freshly squeezed orange juice and were rhapsodising about it. “That’s so lovely, it tastes of real orange” he said. She took a sip of hers and let out a contented sigh in agreement. “It’s nice in here” she said. Maybe that staff member was right: how often did anybody say that in a hospital? My croque madame took long enough that I could be completely satisfied that they’d taken their time over it and done things properly. It looked quite gorgeous – good bread, well toasted, an egg (poached, not fried) perched on top and dusted with what looked like smoked paprika. Only the big pile of rocket – somewhat the Scrappy-Doo or Godzuki of the dish – jarred slightly. Cutting into it, I was even more impressed. Good quality, thick ham, nothing processed or reformed about it. A delicious gooey mixture of cheese and mustard, forming a punchy, claggy layer at the bottom. It was, not to put too fine a point on it, a proper madam. It felt like a bargain at four pounds ninety (although the sign had said it cost 4.9: you can tell what kind of café it is when the price is to one decimal place, the man behind me in the queue had said, and I think he had a point). If I was being fussy, the top should also have been covered in the cheese mixture, or at the very least brushed with oil to give it a gorgeous, burnished quality. If I was being fussy, for that matter, I’d have done away with the rocket. But I didn’t feel like being fussy, I felt like finishing my croque madame and working out what to order next time. I gazed at the blackboard with drinks, and all I could see was excuses to visit again. Chilled lattes! Milkshakes with real ice cream! Granita! Most tempting of all, affogato! A solo lunch cost eight pounds and for that I got a croque madame, a large latte and – to my surprise – a new place to come for lunch when I work from home. Jamaica Blue definitely won’t be for everyone. It’s the wrong end of town for many, and I know quite a lot of people would be too freaked out by hospitals to consider setting foot in one unless they had to, let alone eating in one. But, all that aside, I liked it very much. I admired the bloody-mindedness of doing food like that in a location like that, and as one of the more unusual places I’ve visited in nearly five years of doing this blog I almost think it deserves a visit for novelty value alone. It’s even open seven days a week, so perhaps the next time I go to the excellent local food market in St Luke’s on Erleigh Road I’ll just have to stop there for brunch on my way. One of the saddest events of last year was when Tutti Frutti (Reading station’s terrific ice cream café) closed abruptly back in October. I found out while on holiday: on the Monday morning I grabbed my regular latte from Paul before jumping on the RailAir – a holiday ritual I’ve always loved – and the next thing I knew I was drinking in a plaza in Andalucia and hearing troubling reports from Blighty that Tutti Frutti was no more. They were correct; I’d had my last latte there and I hadn’t even known it. By the time I got back to Reading all the kit had been taken out; five months later, the signs still say a new store is “coming soon”. This is why we can’t have nice things, I ranted on Twitter for what may have been a week but, to many, probably felt like longer. I was cross with Network Rail for not treating Tutti Frutti better. I was cross with our local media for not celebrating the place more (the piece they eventually ran about the closure was an apology of a thing). I was cross with the people of Reading for going to Costa or Starbucks instead, when brilliant coffee and service were a stone’s throw away. After I’d got over it – and, I suppose, myself – I realised the truth was more complicated. There was another reason why nobody had seemed to know Tutti Frutti was there. Several other reasons, in fact: no website; limited Facebook presence and a Twitter feed which made it look like the place closed a long time ago (the last Tweet dated from June 2015). Could anybody rely solely on word of mouth in this day and age? Was it enough to expect your customers to do your advertising for you? In my head, I composed a long (and pompous) feature, explaining where all these restaurants were going wrong. I decided it wasn’t hard to run a good Twitter feed without pouring huge amounts of time into it. Just be chatty and engaging. Follow back and reply. Tweet a few times a day at the very least. Put pictures up of your food that made people want to come in and eat it. Use hashtags. Make sure followers got an idea of the personality of your brand. Could it be that difficult? Perhaps it was, because I struggled to think of Reading restaurants and cafés that pulled it off. Shed and the now-departed Mya Lacarte got the tone right, but couldn’t manage the frequency. Workhouse had the opposite problem. Thames Lido was good at it, but then they did it with the sort of polish that suggested that it was somebody’s Actual Job. Nowadays it’s much easier: all I have to do is say look at Fidget & Bob’s Twitter feed, because they get this stuff right in a way many bigger establishments could learn from. They started Tweeting even before they began trading, and followers could see the establishment coming together – counters being built, dishes being tried, suppliers being chosen. By the time they opened their doors, you already felt invested in this little café/bar/restaurant out in the wilds of Kennet Island (or I did, anyway) and I wanted them to do well. Over the last couple of months they’ve built on that, to the extent where I can honestly say that without their Twitter feed I might not have hopped in my mum’s car and made the trip out of town on a cold, crisp night, the threat of impending snow hanging in the air. Truth be told, the last time I’d visited Kennet Island was to have a colonoscopy at the Circle Hospital, so I was looking forward to something going in the right end for a change. That anatomical detail aside, I liked Kennet Island, and the piazza was incongruously nice: not Andalucia nice, perhaps, but still a surprisingly pleasant open space. I could imagine a pleasant summer afternoon sitting outside, taking in the sun. There was free parking on the square and an inviting glow coming from the windows, although the place was almost empty when we walked in. Essentially, it was a big rectangular space with a number of tables – one large one with benches for communal dining and a number of smaller ones for groups of two or four. The furniture was all mismatched without seeming twee or quirky, and a wall was plastered with kids’ drawings. I liked the long counter and bar at the back of the room, and the industrial-but-not-pretentious light fittings. We grabbed a table by the window, feeling a little spoilt for choice. Service, from the co-owners, was terrific from start to finish, although I hadn’t really expected anything less. I ordered a latte to warm up and a glass of wine to drink while we looked at the menu. I was told that the coffee was from Clifton Roasters in Bristol – a decision they had obviously taken time over – and it paid off, being smooth and complex. My red wine – nero d’avola – came in an attractive stemless glass and had lovely hints of smoky cherry. Fidget & Bob make no secret of buying their wine in boxes and, on this basis, it seemed like another excellent decision (also, it means they can offer 500ml carafes – how I wish more places would do this). My mum fancied a gin and tonic and one of the co-owners talked us through the options, which included Toad, from The Oxford Artisan Distillery. She wasn’t persuaded at over five pounds for a single to see if it was as good a gin as it was an acronym, but the Plymouth and tonic went down well. Kudos to Fidget & Bob for only charging eighty pence for Fever Tree tonic, although the overall effect was slightly marred by only adding a solitary ice cube; it wasn’t that cold out there. The menu was small and perfectly formed, in more ways than one: not only were they all small plates, but the range was on the narrow side. A few nibbles, a cheeseboard, a soup, four different “pizza” (inverted commas theirs) in two sizes and two specials, both bao, steamed buns. I could see a fair few things I fancied trying, but I couldn’t help but feel I’d end up ordering most of the menu – partly to sample a decent range, but mainly because otherwise I’d leave hungry. I had reckoned without my mother, the woman who orders half sandwiches at Pret and has the discipline to have a couple of squares of chocolate a night (discipline, needless to say, I haven’t inherited). I cast my mind back: I was sure I could remember occasions where she’d ordered three courses in a restaurant, but try as I might, I couldn’t bring them to mind. In any case, my mum is not a woman to be trifled with. We settled for one each of the two bao and a pizza to share (small rather than large: my mum insisted, and the co-owner agreed, sagely telling us that a large would be too much). I was tempted to order a cheeseboard, too, but I decided I already knew that Fidget & Bob bought well: the question now was whether they cooked well too. Much is made of restaurants with a “chef’s table” where you can see everything going on around you. 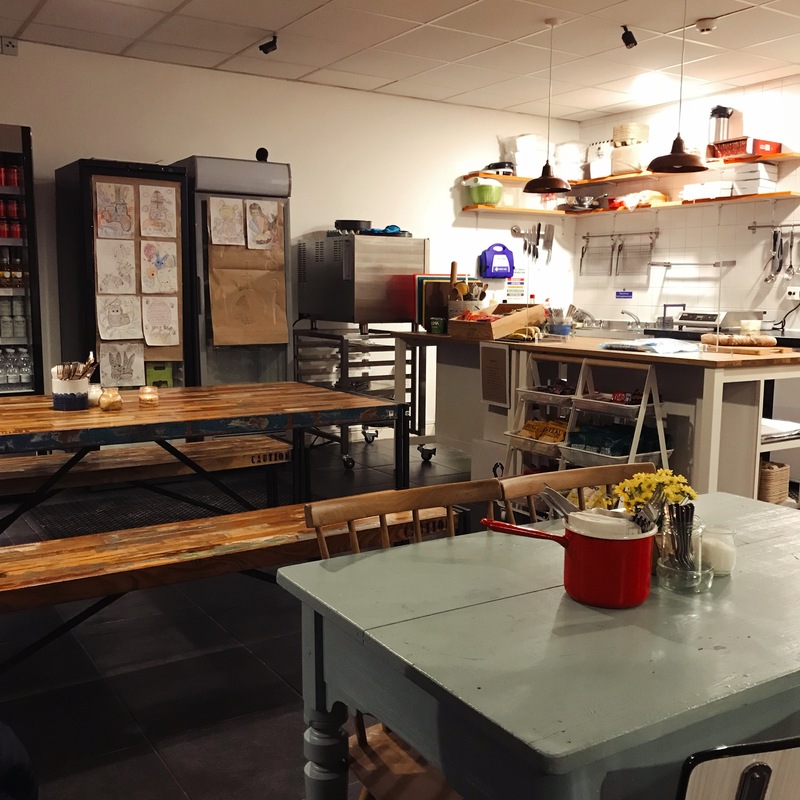 Well, you get that experience at Fidget & Bob without having to brag about it – they go about their business chopping and steaming and topping and cooking and frying just the other side of the counter, seeming to have a lovely and companionable time as they do it. Another couple of tables were occupied by the time our food began to arrive, and I saw chicken wings arrive at another table looking, as they always do, nice enough to make me wish I could be bothered with chicken wings. A little enamel cup full of salted popcorn – a nice touch – helped the time pass until our food arrived and, not for the first time since I arrived at Fidget & Bob, I found myself thinking there really was no rush. My mother and I chatted away: despite her lack of appetite the popcorn inexplicably disappeared in no time. I had been dubious about Fidget & Bob’s pizzas, having seen pictures on their Twitter feed. The inverted commas were because it was served on a flatbread rather than a traditional base, and somehow that felt like a way you might cheat at home rather than cook in a restaurant. But what won me over and made me order it was another Twitter picture of onions, slow roasting in the oven, realising their sweet, golden potential. I wasn’t disappointed when my onion and mushroom pizza arrived. 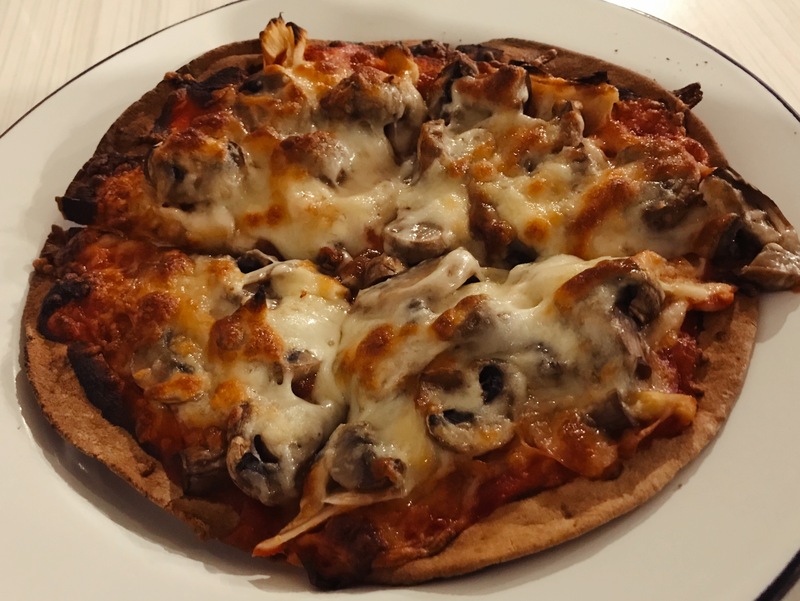 It may have looked makeshift, but it was very tasty and didn’t stint on mushrooms, onion or nicely bubbled cheese. Well done, too, in that you didn’t take a bite and find the whole topping sliding away as can sometimes happen. The onions had just the right sweetness, the mushrooms added a beautiful roasted nuttiness. A small pizza was dessert-plate sized and cost six pounds fifty – this felt ever so slightly on the pricey side, but that may have been god’s way of telling me I should have ordered a large one. It would have all been eaten, put it that way. 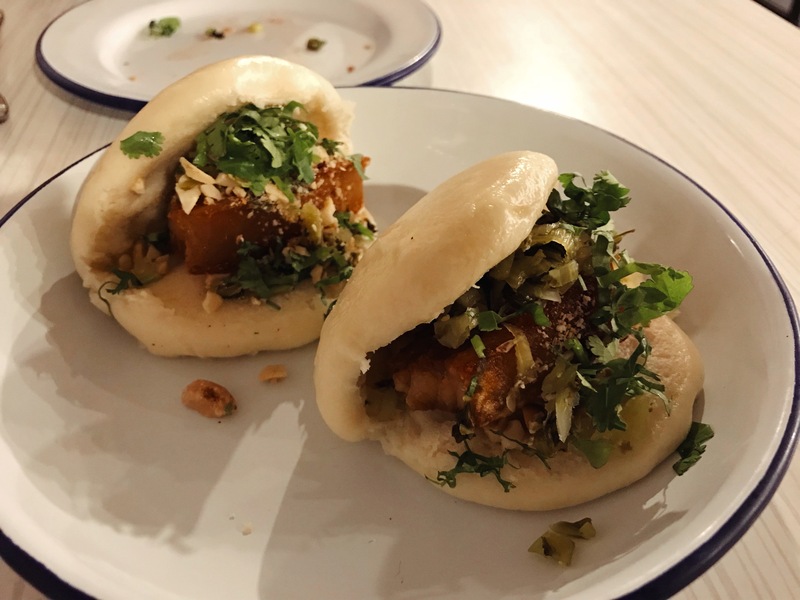 The bao were another matter. Like Fidget & Bob, I felt invested because I’d seen them assembled, gradually, from a distance. I saw the buns gradually rise in the steamer, I saw the pork belly on the pan. 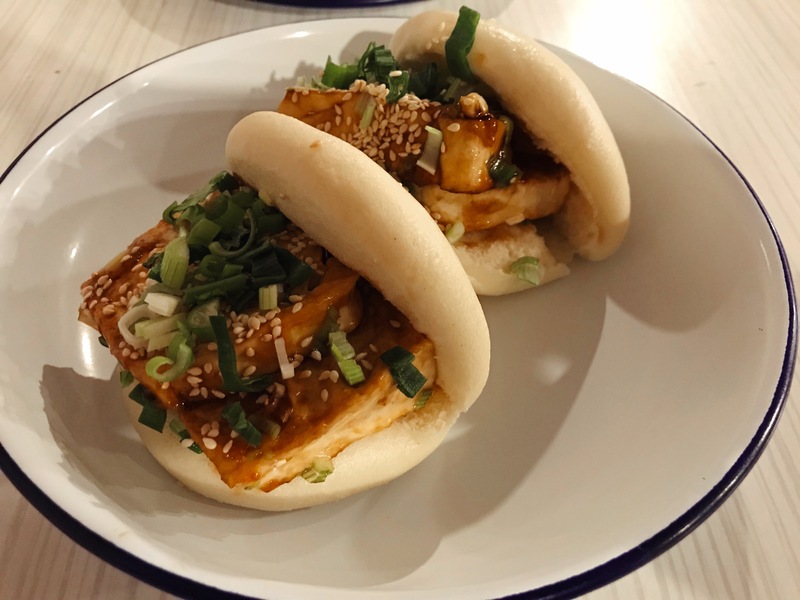 And when they turned up, both the pork and tofu bao, I wanted them to be great but they were near misses – good near misses, but near misses all the same. The pork belly was very well cooked with just enough crispy texture and no wobbly fat, and the chopped spring onion, coriander and peanut on top was lovely stuff. But it was too delicate, and it needed a sauce to bring it all together. The tofu would have been superb if it had had some crispiness, but it was lacking that element which meant the whole thing was too soft and pillowy. The advertised wood ear and shiitake mushrooms were missing, replaced instead with an additional slab of tofu, and although there was oyster sauce on top it needed more. Only the scattering of sesame seeds rescued it from being just too softly spoken. I thought they needed more oomph, while my mum – who talks about having a very indelicate palate almost as it proud of it – found them bland. This is a shame, because it’s a fantastically brave and creative thing for a little café in Kennet Island to do. They were close enough to how I imagined they could be that I still fancied giving them a whirl another time. I would have had a dessert – the “gooey chocolate croissant pudding” was calling to me – but my mum pronounced herself full (or, more precisely, only having room for a couple of squares of chocolate later) so we settled up. Dinner for two came to £35, not including tip. As we were paying we chatted to one of the owners and again, it was lovely to see her so enthusiastic about what they were building here. “We have these charging points set up”, she said, pointing to the counter up at the window, “so that people can log in and work from the wi-fi here. We get quite a few people during the day, and you get a little stir crazy working from home.” I could imagine it would be a very nice place to take a break from a solitary day cooped up in the house, and for a moment I wished there was a place like that near me. I think even the owners of Fidget & Bob would never pretend for a minute that they’re the finished article. In fact, to their credit, I think they probably don’t see the journey they’re on as one that has a defined end anyway. It is a lovely place, with a certain something you can’t fake or make on an assembly line which is all about love and passion. And although not all the food I had was brilliant, and some things on the menu need a bit of tinkering, I really hope they keep up the good work and that they get a loyal clientele which goes with them. One of the big questions in my mind about Fidget & Bob was: is it good, or just Kennet Island good? I’m still not entirely sure, but put it this way: the next day I was snowed in and working from home and looking at my Twitter I saw a picture from Fidget & Bob of their chalkboard, surrounded by the snowy piazza. On it, it told people to come in and wait out of the cold for the bus into town. “No purchase necessary”, it said. And I thought: You know what? Even just reading that makes me want to come and eat with you again. Sometimes we all forget the social in social media, and eating too, done properly, is a social thing. Fidget & Bob get this so right that, even on a bitter winter’s day, it’s impossible not to warm to them.